Though no author is claimed in the book of Nehemiah it is believed that Ezra or Nehemiah wrote the book. The book is a first person account of the events from the perspective of Nehemiah. The books of Ezra and Nehemiah were originally combined into a single book. This is part of the reason some scholars think that Ezra wrote both books. Many Jews had returned from the Babylonian captivity. They were rebuilding Jerusalem. But Nehemiah was burdened by the fact that the city walls were still in shambles. Though still living away from Jerusalem, he communicated with those who were living there. He fasted, mourned and prayed for the rebuilding of the walls of his beloved city. In Nehemiah’s prayer to God he confessed that he knew Israel’s sins were the cause of his nation being scattered among the heathen. Nehemiah knew God’s promises to Moses that they would be blessed if they followed God, but punished if they strayed from him. Nehemiah did not deny that God’s punishment was necessary. However, he called upon the mercy of God to help them rebuild the walls of Jerusalem as the people returned to the city of God. 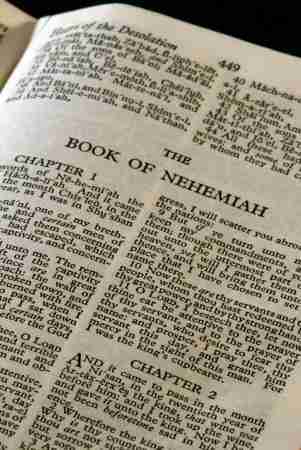 The book of Nehemiah is a great story of the rebuilding of Jerusalem. It also serves as an example to us that we need to be constantly reminded of God’s Word. Nehemiah worked as the cupbearer to the Persian king Artexerxes. After Nehemiah’s great grief could no longer be hidden, the king inquired as to what troubled his servant. Nehemiah responded that his beloved city was destroyed and in ruins. He asked permission to go and help build the city. Not only did the king give him permission, the king gave him the resources he would need to accomplish the task. The king granted military troops, horsemen, letters of passage and even building materials for Nehemiah to use. Along the way the news of Nehemiah’s return became known to the enemies of Israel. Particularly important in the story were Sanbalat the Horonite, Tobiah the Ammonite, and Geshem the Arabian. They vowed to stop Nehemiah and the Jews from rebuilding the city. Up to this point Nehemiah had not divulged his whole intent for going to Jerusalem. Apparently those around him thought he only wished to return for a visit. But one night while everyone was sleeping, Nehemiah stole away to survey the city and determine everything that was necessary to do the work of rebuilding the walls. He then shared his plan with the Jews around him. Nehemiah set various men and families in charge of different portions of the project. Instead of one large project where Nehemiah tried to control every worker, he broke the building efforts into groups. Men were put in charge of smaller portions of the wall. Each family built the portion of the wall that was closest to their own dwelling. The project seemed less overwhelming to them this way. The project seemed to go well until it was about half complete. The enemy became more and more worried about the progress. They tried to descend on Jerusalem secretly to fight. Nehemiah and the inhabitants of Jerusalem prayed to God for safety. They prepared for battle. When Sanbalat, Tobiah and all their allies saw that the Jews were prepared for war, they backed off their attack. Nehemiah and the Israelites worked with trowel in one hand and sword in the other. Half were prepared for war while half continued the work of strengthening the walls that were necessary for the protection of Jerusalem. Through the completion of the project the Jews within the walls never even relaxed enough to prepare for bed. They wore their work and fighting clothes constantly except when they had to be laundered. Those who had become rulers in the dilapidated city of Jerusalem during the captivity had used their power to their own benefit. They required those who had returned to the city after the captivity to buy back the possessions that were previously owned by their families. They were paying undue taxes and interest on things that should have been theirs. Nehemiah put a bold stop to that practice. Seeing the wisdom and kindness he possessed, the people of Jerusalem appointed him Governor of the city for 12 years. He would not even accept the pay that was due a man in his position. His singular focus was on rebuilding the wall and protecting his city. The enemies of Israel requested an audience with Nehemiah. But he would not leave from the work because the job was too important. He knew that their intentions were to distract Nehemiah from his task. They continued to solicit Nehemiah to come and meet with them. They even accused him of wanting to build the wall for personal advancement. Nehemiah heard the enemy expected the people to tire of working. He prayed that God would strengthen their hands to complete the task. And complete it they did. Rebuilding the walls of Jerusalem only took 52 days. Though the walls were built, there were few inhabitants in the city. They still needed to build houses and bring in families to care for the city. Though there were walls, the city was still fairly defenseless. Therefore, Nehemiah said to not open the gates until the sun was well up in the sky and when they did that there should be guards posted at all times. A genealogy was taken of the children of Israel in the land. They numbered 42,360. More than 7,500 servants and singers lived among them. Ezra the scribe (also sometimes called Ezra the priest) took the Law of Moses and read it to the congregation before the water gate of Jerusalem. He read the Law from morning to midday. The people stood while Ezra read. The people wept upon hearing God’s commands. But Nehemiah stood and commanded the people that the day should be a holy day—a day to celebrate the reading of the Law—and not a day of mourning. The second day of the reading of the Law they learned about the feast of tabernacles. It was a seven-day feast. While they celebrated Ezra continued to read from God’s Word each day. They continued to read from the Bible. They began to confess their sins. Half of each day was spent in reading God’s Word and confessing their sins. Their teachers would then stand and plead with the people to bless and praise the Lord. The leaders in the city taught the history of Israel as told in the Law of Moses. They taught stories from Abraham to the Exodus; from the giving of the Law to conquest of Canaan. Even the unflattering stories of the Israelites hardening their hearts against God were taught to the inhabitants of Jerusalem. They were admonished to surrender to Jehovah God and become His servants. This chapter starts with a very long list of people who sign a covenant to obey the Laws of God. Then it concludes with a list of specific laws that they enacted and promised to obey. Of the 42,000+ Israelites mentioned in chapter 7, not all of them lived in Jerusalem. Many of the rulers in Israel lived there as well as about 10% of the rest of the population. Those chosen to live in Jerusalem were chosen by casting lots. Or, we could say it was a lottery process. But living in Jerusalem at that time was not as prestigious as it had been previously or would be in the future. This was a city that had sat defenseless for years. Those who lived there risked being attacked by surrounding nations that had become accustomed to taking what they wanted. People were chosen among the population as singers and musicians for the dedication of the wall. The priests and Levites prepared themselves and purified the people for the dedication ceremony. Those chosen for the dedication were divided into two groups. Half went with Ezra and the other half with Nehemiah as they walked around the city upon the walls giving thanks to God. The people offered sacrifices and rejoiced within the city of Jerusalem. They again read the books of Moses. They were reminded of promises, covenants and laws that had long been forgotten. Part of the covenant they signed in chapter 10 concerned not marrying people from other nations. They were reminded of the Ammonites and Moabites that should never dwell among the people of God. While they worked to purify themselves from other nations there was still corruption in the leadership of Israel and Jerusalem. Nehemiah returned to his post in Persia. When he took vacation from his duties he visited Jerusalem. Each time he returned to his people there was a time of purification. They needed to be constantly reminded of their promises before God. Resources were used improperly. God’s house was forsaken. They ignored the Sabbath. They even began marrying from other nations. All these things they had promised not to do. Nehemiah even resorted to physical persuasion to get them to remember their promises to God. The book of Nehemiah is a great story of the rebuilding of Jerusalem. It also serves as an example to us that we need to be constantly reminded of God’s Word. Getting away from the people of God and the Word of God causes us to drift back into old actions and habits. Thankfully we have the Holy Spirit indwelling us as believers today. Yet, we too can grow cold to the promises we’ve made to God if we do not cultivate our relationship to Him.